They support the vast range of activities and services for young people in Leicestershire such as youth groups, sports clubs, uniformed groups and schemes for unemployed or disabled young people. We want to recognise and support local volunteers and encourage more people to get involved in volunteering. 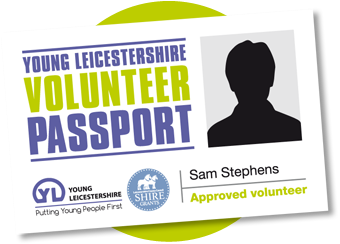 Thats what the Young Leicestershire volunteer passport is all about. WHAT IS THE VOLUNTEER PASSPORT? It’s a short training course covering the key skills you need to have to work with young people. Each session is led by experienced and fully qualified tutors. When you have finished training you will gain a nationally accredited qualification from the NCFE and a Volunteer Passport photo ID badge. The training, your Volunteer Passport ID badge and certificate are free of charge. You can wear the badge when you are volunteering to show that you have undertaken the Volunteer Passport accredited training course. WHO CAN GET A VOLUNTEER PASSPORT? 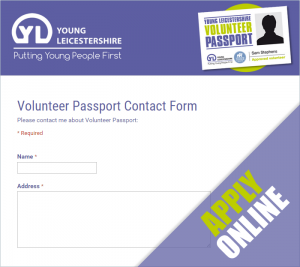 The Volunteer Passport is for anyone over the age of 16 who volunteers with children or young people or who wants to volunteer in the future. You could be an experienced volunteer who already gives several hours a week. Or you could be thinking about volunteering for the first time. You don’t need any qualifications to train for a Volunteer Passport. WHY GET A VOLUNTEER PASSPORT? It demonstrates you have the basic skills needed to volunteer with young people. The training will help you to build on any volunteering experience you already have. If you are thinking about a future career working with young people. A Volunteer Passport can help give you confidence and open doors. DO I NEED A DBS CHECK? Yes, you must have a DBS check before we can issue a Volunteer Passport. If you are already volunteering with young people you will have a DBS check. If you are new to volunteering you are welcome to apply to do the training sessions but we will not issue a Volunteer Passport until you get a DBS check. WHAT HAPPENS AFTER I’VE GOT MY VOLUNTEER PASSPORT? If you are not already a volunteer we can help you to find an opportunity to suit your skills and interests. If you are interested in taking your training further, we can also help you to progress onto national qualification courses. By post: fill in the form on this printable document and send it to: Young Leicestershire Ltd, Warwick Road, Whetstone, Leicestershire LE8 6LW. By telephone: call 0116 2750489. Young Leicestershire is the biggest provider of open-access clubs for young people in Leicester and Leicestershire with over 15,000 members now attending our network of affiliated groups. We’re passionate about providing young people with the widest possible range of positive activities – which we achieve through leading and supporting voluntary-sector services. We support and help raise funds for everything from sports clubs and young carers’ groups to international conventions and new youth centres. With 60 years’ experience behind us, and professional expertise that’s recognised as unmatched in our field, Young Leicestershire is run entirely as a charitable institution. If you run, or are thinking of starting up, a club for young people in the city or county, there are instant benefits to joining forces with Young Leicestershire. And have been endorsed by Children in Need for our work with underpriveleged young people. Find clubs near you or start your own club with our guidance and support. Volunteer your time, your skills, your leadership. Discover the benefits of involvement as a business. Join the biggest employer of youth workers in the county. We’re reliant on the priceless contribution of a small army of over 2,000 volunteers – who can in turn take a great sense of achievement and community involvement from working with our groups. And our local business partners all report lasting reciprocal benefits when staff volunteer their time to work as a mentor or at a young people’s club, developing their own skills and active citizenship.